Nevins Nursing and Rehabilitation Centre provides comprehensive medical, nursing and rehabilitative care for individuals whose function has been impaired by injury, illness or aging.. Our programs are designed for those patients needing both short term rehabilitation in order to return home and those needing long term care and services. The Nevins Nursing and Rehabilitation Centre, located in Methuen, MA offers bright spacious rooms and an atmosphere of genuine caring to residents and rehabilitation clients. To complement our excellent care, The Nevins Centre also offers a variety of boutique services to help our long term and short stay residents live well. Our short-term stays are designed for patients requiring rehabilitative therapy and treatment after leaving the hospital due to illness, injury, or surgery. 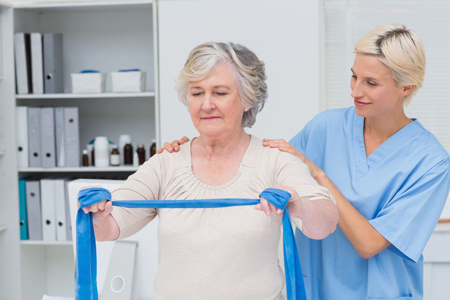 We offer a level of care that family members and home health agencies are typically unable to provide. Our focus is to serve as a bridge between your hospital stay and your return home, making your recovery as speedy and comfortable as possible. Our facility offers bright, spacious rooms and an atmosphere of genuine caring. You, your family, and our clinical team are all involved in decision-making and goal setting. Together, we will explore what skills are needed before you are discharged. We are eager to see you return home stronger, with renewed confidence and independence. Our onsite Medical Staff works closely with your personal physician to design a customized treatment plan including nursing and rehabilitation. We provide access to top-notch clinical specialists and specialty services that will support your successful recovery.